Over the Easter weekend, I was reading The Guardian and came across a full-page photograph taken by Henri Cartier-Bresson on a visit to the Soviet Union in 1954. This stunning photograph was used the following year as the front cover of Life magazine. Other photographs from Cartier Bresson’s trip to Moscow are no less engaging. In Gorky Park a stylish woman in pristine white, floppy hat, and high heels is reading a magazine, whilst in Sokoloniki, adults and children dance. We see people at work and at leisure – fishing and playing chess, rapturously watching a circus, at worship in a church. There are, of course, political questions to be asked. A foreign photographer was surely not let loose to wander the capital unchaperoned. The Soviet government would have had its own agenda; it had an interest, for example, in showing the outside world that churches were open and working. Certain locations were more likely to display the capital in a flattering light. Shopping in the capital’s central streets – as in other countries – was surely a very different experience from those struggling to get by in the suburbs, or indeed in a provincial city. Not many women would have the means to go shopping with the abandon and delight we see in ‘A Hat‘. Looking through these photographs I find myself wondering the extent to which they differ from the images we find in Soviet newspapers and publications. Some feel quite familiar: the muscular bodies of participants on parade at Dinamo stadium; a man at work on the assembly line at the ZIS factory (though would he perhaps have been fully dressed on the pages of Pravda?). One difference struck me, though, the number of old people. In Soviet visual culture the head-scarved middle-aged women and the lined, white-bearded men Cartier-Bresson catches so beautifully in some of these images were, I think, a less frequent sight, despite the growing prestige attributed to the older generation in the post-war period.1 I am also struck by the prevalence of uniforms. Conrad hints at this, suggesting they testify to the ubiquity of surveillance; but perhaps they serve more than anything as a reminder that this is a post-war, militarized, cold-war society? 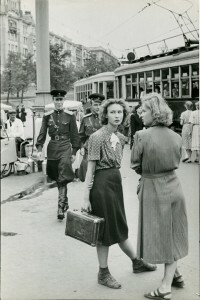 I would be interested to know the responses of other people interested in the Soviet Fifties. On a slightly lighter note, I am also intrigued by this photograph from Cartier-Bresson’s 1973 trip to Leningrad: Is the man sunbathing, and if so why is everyone else fully dressed in coats?! This entry was posted in Digital Russian History, Nostalgia and Memory, Soviet Era 1917-1991, Teaching Russian History, Uncategorized. Bookmark the permalink. These are wonderful! I also clearly do not have Peter Conrad’s eyes, as I see very little of what he apparently does in this particular image. Just looking through it quickly, the only old person is G.B. Shaw–“Friend of the USSR”! Conflicting interpretations of this and any other visual or nonvisual source demonstrate that what we bring to it make for what we think we see. No surprise. Having said that, I’m as disturbed by the jodhpur-wearing official as I am intrigued by the Praxitelean curves of the woman on the left. As for all the rest, I absolutely agree with an expressed perplexity regarding The Guardian’s article. Well…. If Conrad is trying to imply that human nature generally got the better of Communist ideals, he would be largely correct; but he could in, my opinion, have made a far stronger case with something other than the photograph he chose. The overall choice of language–“grim Soviet experiment” “stoically shuffling queue”–recalls a Cold War mentality that should, by now, be better informed. Life in the USSR was often hard, but it was not uniformly grim. Even in describing the young women and the soldiers, Conrad invests an innocent moment with a leering, perverse tone that says more about his own outlook than about anything in the photograph–and in my view, undermines whatever credibility he might have achieved with his earlier description. I agree with you that the photographs do show the side of the Soviet Union that its authorities would prefer to have seen. That was almost a given, and I think it might be interesting to examine why–whether we might find a social/cultural, rather than a political reason; one tied, perhaps, to the concept of saving face, or even of graciously overlooking what isn’t polite to note. Interesting. I read this photo absolutely out of any “political” context. Two officers (army officers not police officers) are not actually looking at the girls at all. Some people at the tram stop are not “patiently queuing” to get on this particular tram (we can see that both tram’s carriages are almost empty) but waiting for some other trams. Everybody looks relaxed on this photograph including a bored-looking seller of sweet “газировка” (fizzy drink, note the pressurised container and a jar for sweet syrup) at the background. Thanks all for the comments. Alison, thanks a lot for the link to Ogonek. I had no idea that this was online! I did find some pictures of the older generation in the issue you’d selected. There are a few picture of ‘important’ middle-aged/elderly men in suits and cultural luminaries of the older generation. As Stephen Lovell notes, even by the mid-30s ‘certain categories of old person – famous scientists, patriarchs of worker dynasties – were shown to be worthy of respect’, not least because Soviet society needed the ‘symbolic authority’ provided by the older generation (Lovell, The Shadow of War, p. 126). There is also one picture of an old man waiting at a station, but I was interested that the caption is ‘waiting for his granddaughter’ i.e. his purpose is to greet the younger generation. In some ways, the differences between Cartier-Bresson’s images and those in Ogonek are perhaps not so very great, but I definitely felt there was somehow a different feel to them which I can’t quite tie down. Of course, you’re right, the desire to save face isn’t uniquely Soviet, but…. Here’s the thing, and I’ve puzzled over it repeatedly: the need to present a positive image at all costs seems to have played out in the Soviet culture with a degree of intensity that I haven’t found matched in too many other places. A few, but not many. And I’m still wondering–why? Thanks for an interesting, and discussion-provoking post. I can’t count how many times I’ve asked myself that question, and you are completly right, if this photo was taken in any other major European city at this time it would’ve been gathering dust on a shelf as far as I’m concerned. This piece is, as far I’m concerened, liberal mental ego masturbation, nothing else. I’d like to pose an opposing view for discussion. One which fights political fire with political fire so to speak. I think alot of gesticulation about the Soviet Union stems from insecurity about the challenge which the Soviet Union, and the ideals it represented, presented and indeed continue to present to the Western way of life. It was, for better or worse. the last radical, and realistic challenge to Western hegemony, and Marxism could still in my opinion very easily rise from the ashes. Marxism continues to present many valid criticisms of our current way of life, particularly surrounding how capitalism as an economic system solves its crises (consider the current UK government’s consultation review on Employment law and George Osborne’s related comments to the business community) and the role of ‘surplus value’ within economic production. It gives capitalism a lot to answer for: e.g. ‘Why is their so much inequality? Why is their no shred of social responsibility in the business world? Why when faced with a choice between preserving human welfare and economic growth, will a ‘liberal’ government nearly always clamber to the defence of the latter?’. In other words, it asks questions, very profound questions of capitalist socio-economic life, by demonstrating that under this system that nothing as is it seems (recall Marx’s use of the commodity to introduce value and simple exchange at the beginning of Capital Vol.1). Indeed, in many ways Capitalism has since Marx been in a perpetual struggle to justify itself on the grounds of human welfare, where as Marxism has to explain the lack of the world revolution Marx, Lenin and Trotsky predicted. Consequentially, I think many individuals in the Western world have a tendency to want to want to see a ‘liberal’ in an ‘illiberal’ society because they want to prove/re-assert the superiority of the ‘liberal/capitalist’ way of life. The problem is, the answers they seek are negative, because they can’t answer Marx on his own terms. They know that when it comes to the crunch (no pun intended) , that he’s write on quite a few counts. Inequality is endemic to our way of socio-economic life, as a worker you are nothing but a commodity to your boss, capitalism is a system which wants infinite growth in a fundamentally finite world, the ‘greater ideal’ most people work day and night for, is quite frankly nothing but the bruised massuse of naked greed in the form of exponentially increasing profit, capitalism does turn everything into a commodity. So rather than provide answers and discuss the merits of the ideals the Soviet Union represented, like anyone with an IQ of 5 would rationally do, they go on the offensive by starting from a pre-determined desire to disprove. They look for the ‘liberal’ subject to prove that behaviour is constituive of human nature, in order to demonstrate that ‘social engineering’ with the aim of normalising social relations back to (a focal point of Lenin’s ‘Государство и революция ‘ I believe), when it comes down to it, naturality in terms of a communal existance is an exercise in moot-point. So in other words, perhaps it says more about our society than the Soviet Union that the ridicolous kind of pseudo-anyalsis this article represents is given the time of day. Is it not in some way remarkable that the idea’s of a collapsed state and an eccentric German polyglot from two centuries ago still make us, provoke so much childish feeling? Is it not a chilling statement of how conservative our culture is? (Consider here a core tenet of Baumann’s ‘Liquid Modernity’, that liquidity extends only to the economic and the social, as the political sphere remains as ideologically static). More to the point, is it not even more remarkable that no positive answers can be found to the questions Marxism asks, over a century after its two founder perished? Either that, or he just wanted to sell a few newspapers. This is a little tangential, but to follow up on the google books topic I wanted to mention that Sarah J. Young from UCL keeps a very interesting academic blog-http://sarahjyoung.com/-, and she frequently notes google books resources. She has an ongoing project to list the contents for available 19th century Russian journals to make them more accessible. She started with Russkii Vestnik and has gone backwards from 1869 to 1856. Another highlight is her list of books about exile in Siberia. I’ve been slowly gathering lists of Russian history related titles available on google books for my blog historichnik and would be grateful for any other suggestions. Thanks for these links. Steve, perhaps we can add them to the list you’re compiling? Recently I went to an exposition in the Centre Pompidou about Henri Cartier and It said that in this photo Cartier was trying to show everyone that people from URSS is the same that in any other place, that man likes to see woman, that people takes the train, etc. This for me, it’s a better explication than the one from Conrad having in mind that Cartier wasn’t against communism.